Safaeian, L., Yaghoobi, S., Javanmard, S., Ghasemi-Dehkordi, N. (2017). The effect of hydroalcoholic extract of Otostegia persica (Burm.) Boiss. against H2O2-induced oxidative stress in human endothelial cells. 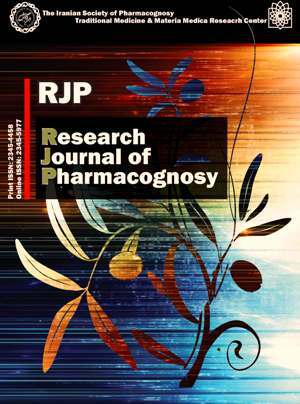 Research Journal of Pharmacognosy, 4(1), 51-58. L. Safaeian; S. Yaghoobi; S.H. Javanmard; N. Ghasemi-Dehkordi. "The effect of hydroalcoholic extract of Otostegia persica (Burm.) Boiss. against H2O2-induced oxidative stress in human endothelial cells". Research Journal of Pharmacognosy, 4, 1, 2017, 51-58. Safaeian, L., Yaghoobi, S., Javanmard, S., Ghasemi-Dehkordi, N. (2017). 'The effect of hydroalcoholic extract of Otostegia persica (Burm.) Boiss. against H2O2-induced oxidative stress in human endothelial cells', Research Journal of Pharmacognosy, 4(1), pp. 51-58. Safaeian, L., Yaghoobi, S., Javanmard, S., Ghasemi-Dehkordi, N. The effect of hydroalcoholic extract of Otostegia persica (Burm.) Boiss. against H2O2-induced oxidative stress in human endothelial cells. Research Journal of Pharmacognosy, 2017; 4(1): 51-58. 1Department of Pharmacology and Toxicology, Isfahan Pharmaceutical Sciences Research Center, School of Pharmacy and Pharmaceutical Sciences, Isfahan University of Medical Sciences, Isfahan, Iran. 2Applied Physiology Research Center, Cardiovascular Research Institute, Department of Physiology, School of Medicine, Isfahan University of Medical Sciences, Isfahan, Iran. 3Department of Pharmacognosy, School of Pharmacy and Pharmaceutical Sciences, Isfahan University of Medical Sciences, Isfahan, Iran. Background and objectives: Otostegia persica (Burm.) Boiss. is an endemic plant of Iran with various applications in traditional medicine which contains of several antioxidant constituents. This research was aimed to investigate the effect of hydroalcoholic extract from O. persica aerial parts in human umbilical vein endothelial cells (HUVECs) using hydrogen peroxide (H2O2) as an inducer of oxidative damage. Methods: The total phenolics content of the extract was estimated using Folin-Ciocalteu method. The probable cytotoxicity of O. persica extract and also its cytoprotective effect on HUVEC cells against oxidative stress was assessed using 3-(4,5- Dimethylthiazol-2-yl)-2,5-diphenyltetrazolium bromide (MTT) assay. The intra and extra-cellular hydroperoxides concentration and ferric reducing antioxidant power (FRAP) were determined in pretreated cells. Results: Total phenolics content was found to be 42.41±0.1 mg tanic acid equivalent/g of thedried extract. No cytotoxic effect was observed from O. persica extract in the range of 25-250 µg/mL. Pretreatment of HUVECs with O. persica extract with the concentrations of 50-250 µg/mL significantly reduced the cytotoxic effect of H2O2. Otostegia persica extract attenuated the concentration of hydroperoxides and increased FRAP value in intra- and extra-cellular fluids at different concentration ranges. Conclusion: This study indicated the antioxidant and cytoprotective activities of O. persica extract against H2O2-induced oxidative stress in HUVEC cells; however, more researches are required for finding the precise mechanism and assessing its clinical value. Gross M. Flavonoids and cardiovascular disease. Pharm Biol. 2004; 42(S1): 21-35. Kris-Etherton PM, Keen CL. Evidence that the antioxidant flavonoids in tea and cocoa are beneficial for cardiovascular health. Curr Opin Lipidol. 2002; 13(1): 41-49. Safaeian L, Haghjoo-Javanmard SH, Ghanadian M, Seifabadi S. Cytoprotective and antioxidant effects of Echium amoenum anthocyanin-rich extract in human endothelial cells (HUVECs). Avicenna J Phytomed. 2015; 5(2): 157-166. Babaee F, Safaeian L, Zolfaghari B, Javanmard SH. Cytoprotective effect of hydroalcoholic extract of Pinus eldarica bark against H2O2-induced oxidative stress in human endothelial cells. Iran Biomed J. 2016; 20(3): 161-167. Cai H, Harrison DG. Endothelial dysfunction in cardiovascular diseases: the role of oxidant stress. Circ Res. 2000; 87(10): 840-844. Touyz RM, Briones AM. Reactive oxygen species and vascular biology: implications in human hypertension. Hypertens Res. 2011; 34(1): 5-14. Schulz E, Anter E, Keaney JF Jr. Oxidative stress, antioxidants, and endothelial function. Curr Med Chem. 2004; 11(9): 1093-1104. Praticò D. Antioxidants and endothelium protection. Atherosclerosis. 2005; 181(2): 215-224. Yoo KM, Lee CH, Lee H, Moon B, Lee CY. Relative antioxidant and cytoprotective activities of common herbs. Food Chem. 2008; 106(3): 929-936. Asghari G, Nourallahi H, Havaie SA. Antimicrobial activity of Otostegia persica Boiss. extracts. J Pharm Sci. 2006; 1(1): 53-58. Safaeian L, Ghasemi-Dehkordi N, Javanmard ShH, NamvarH. Antihypertensive and antioxidant effects of a hydroalcoholic extract obtained from aerial parts of Otostegia persica (Burm.) Boiss. Res Pharm Sci. 2015; 10(3): 192-199. Bezenjani SN, Pouraboli I, Malekpour Afshar R, Mohammadi Gh. Hepatoprotective effect of Otostegia persica Boiss. shoot extract on carbon tetrachloride-induced acute liver damage in rats. Iran J Pharm Res. 2012; 11(4): 1235-1241. Shrififar F, Yassa N, Shafiee A. Antioxidant activity of Otostegia persica (Labiatae) and its constituents. Iran J Pharm Res. 2003; 2(4): 235-239. Sieuwerts AM, Klijn JGM, Peters HA, Foekens JA. The MTT tetrazolium salt assay scrutinized: how to use this assay reliably to measure metabolic activity of cell cultures in vitro for the assessment of growth characteristics, IC50-values and cell survival. Eur J Clin Chem Clin Biochem. 1995; 33(11): 813-823. Wolf SP. Ferrous ion oxidation in presence of ferric ion indicator xylenol orange for measurement of hydroperoxides. Methods Enzymol. 1994; 233: 182-189. Benzie IF, Strain JJ. The ferric reducing ability of plasma (FRAP) as a measure of “antioxidant power”: the FRAP assay. Annal Biochem. 1996; 239(1): 70-76. Tofighi Z, Alipour F, Yassa N, Hadjiakhoondi A, Hadavinia H, Goodarzy S, Golestani R. Chemical composition and antioxidant activity of Otostegia persica essential oil from Iran. Int J Essen Oil Ther. 2009; 3: 45-48. Cai H. Hydrogen peroxide regulation of endothelial function: origins, mechanisms, and consequences. Cardiovasc Res. 2005; 68(1): 26-36. Ayatollahi SA, Kobarfard F, Asgarpanah J, Rahmati Roodsari M, Fanai Gh, Iqbal Choudhary M. Diterpenoids of Otostegia persica (Burm.) Boiss. Daru J Pharm Sci. 2009; 17(4): 290-293. Park JY, Kang KA, Kim KC, Cha JW, Kim EH, Hyun JW. Morin Induces heme oxygenase-1 via ERK-Nrf2 signaling pathway. J Cancer Prev. 2013; 18(3): 249-256. Jeong YM, Choi YG, Kim DS, Park SH, Yoon JA, Kwon SB, Park ES, Park KC.Cytoprotective effect of green tea extract and quercetin against hydrogen peroxide-induced oxidative stress. Arch Pharm Res. 2005; 28(11): 1251-1256. Zhang J, Melton LD, Adaim A, Skinner MA. Cytoprotective effects of polyphenolics on H2O2-induced cell death in SH-SY5Y cells in relation to their antioxidant activities. Eur Food Res Technol. 2008; 228(1): 123-131. Mi Y, Zhang C. Protective effect of quercetin on Aroclor 1254-induced oxidative damage in cultured chicken spermatogonial cells. Toxicol Sci. 2005; 88(2): 545-550. Perez-Vizcaino F, Duarte J. Flavonols and cardiovascular disease. Mol Aspects Med. 2010; 31(6): 478-494. Xiao HB, Jun-Fang, Lu XY, Chen XJ, Chao-Tan, Sun ZL. Protective effects of kaempferol against endothelial damage by an improvement in nitric oxide production and a decrease in asymmetric dimethylarginine level. Eur J Pharmacol. 2009; 616(1-3): 213-222. Nardini M, Pisu P, Gentili V, Natella F, Di Felice M, Piccolella E, Scaccini C. Effect of caffeic acid on tert-butyl hydroperoxide-induced oxidative stress in U937. Free Radic Biol Med. 1998; 25(9): 1098-1105. Kang U, Park J, Han AR, Woo MH, Lee JH, Lee SK, Chang TS, Woo HA, Seo EK. Identification of cytoprotective constituents of the flower buds of Tussilago farfara against glucose oxidase-induced oxidative stress in mouse fibroblast NIH3T3 cells and human keratinocyte HaCaT cells. Arch Pharm Res. 2016; 39(4): 474-480. Lin CM, Chen CT, Lee HH, Lin JK. Prevention of cellular ROS damage by isovitexin and related flavonoids. Planta Med. 2002; 68(4): 365-367.